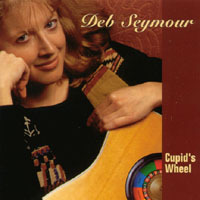 Jumping nimbly between jazz, blues, Latin, folk & pop genres, master musical storyteller Deb Seymour's songs range from a gambling Cupid, wishing for the perfect man, staying out of "Trouble" and love lost on a tropical windstorm... all while still "Not Out of the Woods" "Cupid's Wheel" sparkles with clean production values and social awareness. "Folk music that won't bore even the anti-folkies amongst you!" "Infectious music and lyrics that are habit-forming... soon you, too, will be viewing the world through Seymour-colored glasses"
"Twelve Shades Of Blue" is a pretty and delicate country waltz, beautiful in its straightforward simplicity and intimate sadness. It has a fell of a country classic. Another favorite has to be "Tropic Winds", with it's gentle Latin rhythm: Deb's soft, almost Astrud Gilbereto-like vocal treatment of this tune underscores the sensual longing it describes. There is an honesty here that is very appealing and Nick Dallett does a fine job on the guitars. This album is the evidence of Deb's growth both as a writer and singer since the 1992 release of her first album "Martian Tangos" This one has a greater range of feeling and the singing is gentler, yet more confident. Her first album was largely humor, and though there is humor here, too, "Cupid's Wheel" is more introspective. This is a stronger woman. There is fun stuff here as well as social awareness, but the real jewels are the ones that come from the heart.